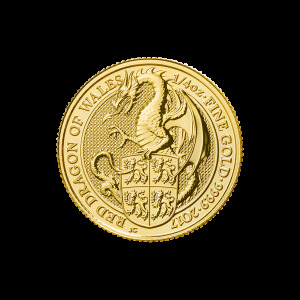 Enjoy the best price on the web, when you order your 1/4 oz 2018 Royal Mint Queen's Beasts Black Bull of Clarence gold coin from our shop now. The Royal Mint, in conjunction with skilled designer, Jody Clark, have added another striking work of art to this acclaimed series, each release of which features one of the 10 wild and wonderful beasts who stood watch over Elizabeth II's 1953 coronation ceremony. The reverse feature of the Black Bull of Clarence, is a herald passed down to Elizabeth II from Edward IV and the beast clutches the arms of the same king, which were also, incidentally, those carried by Richard III, as well as the houses of Tudor and Lancaster. The bull is cast on a field of light-catching, textured design and surrounded by details of the coin's purity, weight and title. The coin's obverse is no less striking, thanks to talented designer, Jody Clark; it boasts an immaculate portrait of Elizabeth II, set on a similar textured field to the reverse. The effigy is encapsulated by the coins details of denomination, as well as Elizabeth II's regal title. The original Queen's Beasts sculptures, which once stood at Westminster Abbey, were created by renowned artist, James Woodford. Take home this highly collectible tribute to all things British and enrich your portfolio with a 1/4 oz 2018 Royal Mint Queen's Beasts Black Bull of Clarence gold coin today. Reverse Stylized image of the Black Bull of Clarence holding the coat of arms and the words "Black Bull of Clarence 1/4 oz fine Gold 9999 2018"
Stylized image of the Black Bull of Clarence holding the coat of arms and the words "Black Bull of Clarence 1/4 oz fine Gold 9999 2018"
1/4 oz 2018 Royal Mint Queen's Beasts | Black Bull of Clarence Gold Coin Enjoy the best price on the web, when you order your 1/4 oz 2018 Royal Mint Queen's Beasts Black Bull of Clarence gold coin from our shop now. The Royal Mint, in conjunction with skilled designer, Jody Clark, have added another striking work of art to this acclaimed series, each release of which features one of the 10 wild and wonderful beasts who stood watch over Elizabeth II's 1953 coronation ceremony. The reverse feature of the Black Bull of Clarence, is a herald passed down to Elizabeth II from Edward IV and the beast clutches the arms of the same king, which were also, incidentally, those carried by Richard III, as well as the houses of Tudor and Lancaster. The bull is cast on a field of light-catching, textured design and surrounded by details of the coin's purity, weight and title. The coin's obverse is no less striking, thanks to talented designer, Jody Clark; it boasts an immaculate portrait of Elizabeth II, set on a similar textured field to the reverse. The effigy is encapsulated by the coins details of denomination, as well as Elizabeth II's regal title. The original Queen's Beasts sculptures, which once stood at Westminster Abbey, were created by renowned artist, James Woodford. 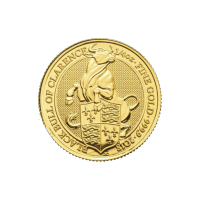 Take home this highly collectible tribute to all things British and enrich your portfolio with a 1/4 oz 2018 Royal Mint Queen's Beasts Black Bull of Clarence gold coin today.